We all have trusted sources of information. Could be a friend, a TV show, a news outlet, a Burger Blog (wink wink), etc, etc. People ask me quite often “how do you know about and find out about all of these Burgers?” While I do admit to having a strong Spider-sense like radar system that I like to call my “Burgerdar,” I too have to rely on a few other places to keep the Burgerverse of info a flowin’. When it comes to the newest and the coolest, I trust Thrillist, and not just because I work there! Trusting them was what got me there. They send out a daily email that highlight the newest and best restaurants, shops, experiences, gadgets and of course, rad Burger joints. You can get on a Thrillist, as of now, in 20 different cities in the US but the biggest one is right here in NYC. This week Thrillist NYC featured a story about Bento Burger. A brand new spot in the EVILL that has a Strange mix of Asian influenced preparations to traditional American Burgerfare. 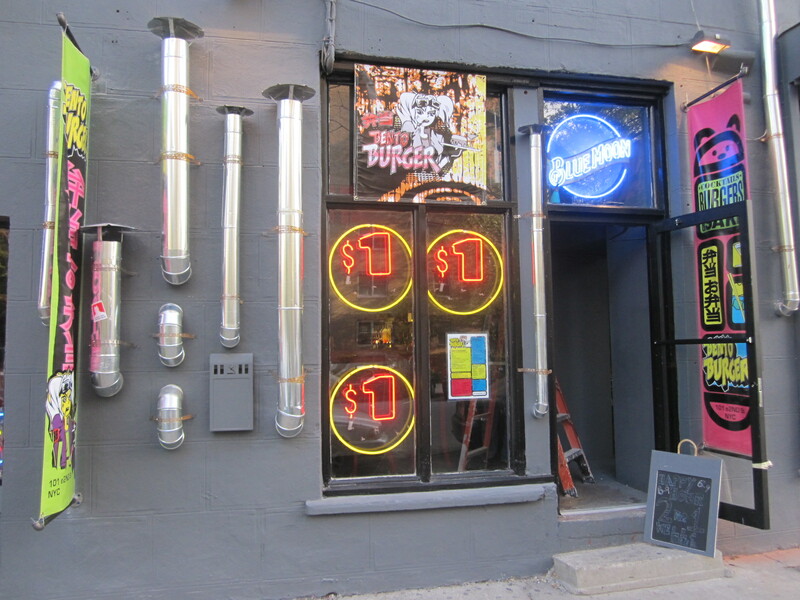 The places looks like it’s right out of an alley way from the movie Blade Runner and I could easily see this existing in Tokyo. 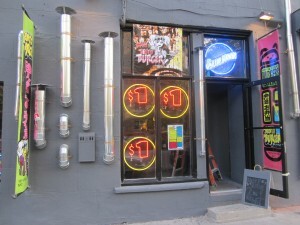 The inside is decorated with a mix of neon lights, graffiti and modern furniture and artwork that all give attitude to the otherwise divy bar hidden underneath the decor. Bento Burger offers “Houseground burgers, 3 beef, including Kobe, Japanese, Korean, Thai chicken, seafood, and 2 veg. Weekly specials. Housemade buns, regular, sesame, gluten free, and asian rice bun, sides of Japanese pickles, asian mango slaw, and choice of another side and sauce. Fabulous drink menu with house infused liquor and lemonade. 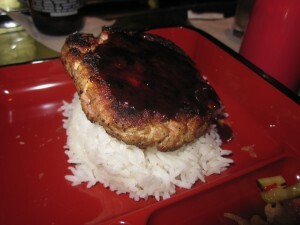 Price range for complete bento burger box $10 through $16. 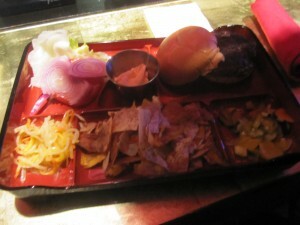 Kobi $19.” The fun part, ALL Burgers are served in Bento Boxes! I wish they wouldn’t have quit on the awesome concept before they got to the beer selection. Bud, Corona and Stella could be replaced by Hitachino, Full Sail Samurai and Kirin Lager. As I was headed into the EVILL for our weekly Friday night Devil’s Night Rock and Roll Happy Hour at Idle Hands Bar, an update from Thrillist on a new Burger was not only timely but also very welcome. My good pal Stabitha agreed to give it a test run with me before we made it over to Idle Hands for some much needed bourbon. 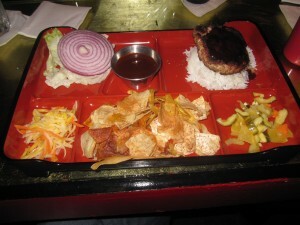 All the Burgers at Bento Burger come in a Bento Box with Japanese Pickles, Mango Slaw and Bento Chips. You also have a choice of buns between regular, Lettuce Wrap, Gluten Free or what I went with, Asian Rice. Because I like to have the full monte of experience when trying out somewhere new, I ordered the Korean Barbecue Bulgogi Pork Burger with Barbecue Sauce on Rice. 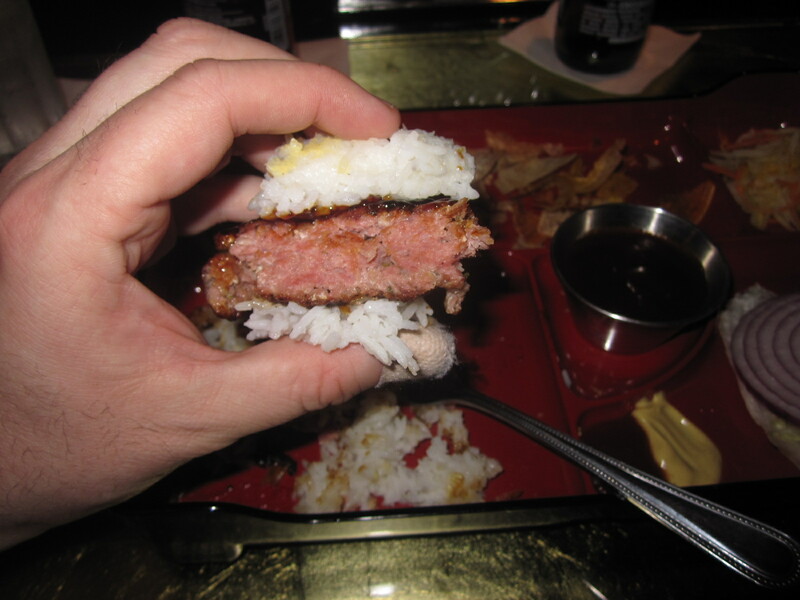 Sarah went for the Hambuugu, which is made from a mix of the different meats at Bento. The Pork was pretty good although not as spiced as I was hoping it would be. 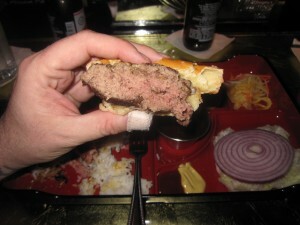 The patty tasted more like a backyard bbq Burger with spices than Korean Pork. It was good for what it was though and I thought the Wasabi Mayo was most excellent. 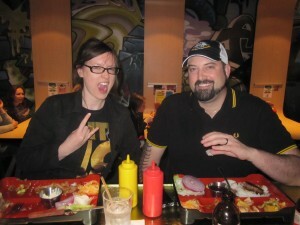 The Rev recently created a meter for assessing how optimized a bar and restaurant is with social networking. He calls it “The Rev Meter.” By taking what he considers to be the 10 most important social networks and creating a point system, The Rev can accurately asses how well the business is using social networking as a tool. His goal here is to educate and assist great business to better effectively use these tools. This entry was posted in Burgers, East Village and tagged bento burger, burger, cheese, ciancio, conquest, East Village, french, fries, great, hamburger, new york, ny, nyc, rev, review, the, the rev meter for social community, thrillist. Bookmark the permalink.